The Shelti Pro Foos 3 is a great quality table with a heavy cabinet design. 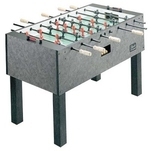 Shelti is known for making American style foosball tables that offer fast action and complex foosball shots. The Pro Foos 3 is one of their top of the line tables that has all of the expensive and high-end parts you need to master the game. 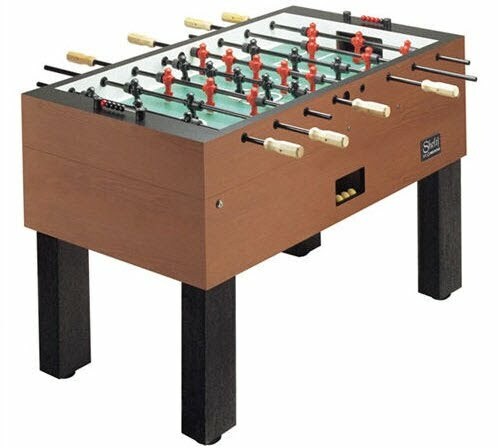 With wooden handles, pointed toe design on the foosball men, a side ball return so you can easily practice and have the balls come back to you, and a solid top surface, this table is a very sought after table among foosers. This foosball table is priced at around $1,850 US.